Susan Crawford recently spoke with Dave Davies on NPR's FreshAir. During the conversation Crawford touches on a variety of interrelated topics that affect telecommunications in the U.S. 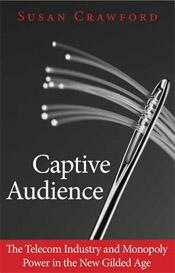 The interview is worth a listen; Crawford and Davies discuss her book, Captive Audience: The Telecom Industry and Monopoly Power in the New Gilded Age, and get into U.S. telecommunications policy. I think the problem is actually much more profound than mere discrimination by a few cable actors when it comes to high-speed Internet access. We seem to currently assume that communications access it a luxury, something that should be left entirely to the private market, unconstrained by any form of oversight. The problem is, that's just not true in the modern era. You can't get a job, you can't get access to adequate healthcare, you can't educate your children, we can't keep up with other countries in the developed world without having very high capacity, very high-speed access for everybody in the country. And the only way you get there is through government involvement in this market. That's how we did it for the telephone. That's how we did it for the federal highway system. And we seem to have forgotten that when it comes to these utility basic services, we can't create a level playing field for all Americans or indeed compete on the world stage without having some form of government involvement. You can listen to the 38 minute interview and read the transcript at the NPR website.